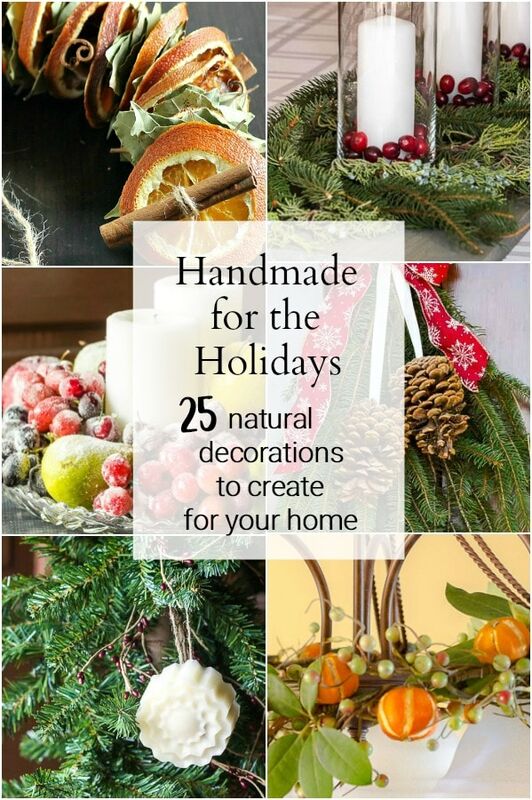 Handmade for the Holidays is an ebook collection of 25 natural decorations to create using the pure beauty of nature to adorn your home this season. I’m a huge nature and plant lover and I’m always looking to natural ways to decorate our home. This could not be truer starting in the fall with Thanksgiving and Christmas. During this time we always have people over to celebrate the holidays with us, and it’s so nice to have our home decor festive and welcoming. Over the last several years while writing this blog I have created many different projects using natural elements. Probably the single most reason is, to me natural decorations make everything you create automatically look beautiful because nature itself is purely gorgeous. For me and for many people, these elements are readily available. It’s very inexpensive to use free materials from your yard. So during the holidays, it’s one less area to spend money. So as we start to think about this season I put together a compilation of projects in an ebook to help you create and enjoy natural decorations for your own home. All you have to do is leave me a comment below about why you love nature to enter the giveaway. Since this is my first venture into the ebook field I’m also offering 30% off for a limited time. Hurry this offer expires at the end of the month on Halloween. Entries must be received by this Sunday evening, Oct 28, 2019, at 11:59 pm EST. The winner will be contacted by email and posted here on Monday, Oct 29, 2019. Prize includes a PDF ebook of Handmade for the Holidays –retail value $9.95 US. To enter, leave one comment [below] about why you love nature. And the Winner is Sheila! Thanks Audrey. You’ve made my day. I love your ebook! Nature is part of what I do in life, bringing it to my home. Congrats on your new e-book, Patti! I love bringing nature in because it adds an element of texture that you can’t get any other way! I love nature especially the fall with all of it’s color. It truly makes me grateful for the creation and it’s Creator. Down in La, there isn’t much fall color so when I can view fall color in person up north or even in decorations, I am inspired. I love to decorate with nature because it brings back memories of growing up on a farm. Nostalgic, peaceful, and warm! I have decorated with natural elements some over the years, but three years ago we moved to Nevada where I finally get all four seasons and love it. I came across your site a few weeks ago and just love it! You have inspired me to do more of the natural decorating. Nature brings me back to center. Calms my mind and my soul! Decorating with nature is such a wonderful idea, I need to bring more into my home. Congratulations on your book, Patti, it looks amazing. There are always natural elements in my C’mas decorations; I started making pomander balls as a new bride 55 years ago and have added various naturals over the years. I love nature because it reminds me that life outside is the universe’s way of healing our souls. It happens “naturally” when you connect to nature. I have subscribed to your blog for a long time. I was never able to take myself away from everyday life but I could at least see and imagine what your were creating. I am retiring soon and I look forward to the moment when I am able to “hang out” with you and create fulltime! I myself use a lot of natural nature items to decorate, It is Gos way of putting beauty in our lives. I will be moving to Austin next week. I think the seasons will be lost in the move. No more scarlet leaves to crunch though and no more snow for Christmas. I love the sun and I marveled at the full moon at 3 am walking my dog. She stops and smells every blade of grass around. When she saw a bunny she ran with me and my cane flying after her. In between the fir trees. I fell and couldn’t get up. So looked at the stars and picked up plnecones I will use later. A half hour later I managed to get back on my feet. Daisy came back. Got my cane up and we sedately walked home. There will be nature to find and explore. I will miss the Ohio but am open to Austin. I love to use natural decorations,too. Over the years, I’ve made quite a few, but never Twig Twees. Yes, that is the way I said it! I’ll dust off my Dremel and give it my best efforts. I’m currently playing with inks on ceramic tiles. Again, you inspired me to get going. Thanks.